Newly constructed apartment complex. Pool and tennis courts. Landscaped gardens. Beautiful Olhos de Agua beach less than 300 metres. All amenities within walking distance. Secure complex with private car parking. Very close to golf courses. I and my wife are related to the medical profession in UK. We purchased this property to spend our holidays since the weather here is very pleasant throughout the year compared to that in UK. We were always keen to buy a property in Algarve due to the fantastic weather. Not to forget lovely beaches and Golf courses. We both are also keen on Formula one and there is a Formula One track nearby which is a bonus. The location is fantastic with beach views from the apartment and also be in the centre of a beautiful Portuguese village.Olhos de Agua, (Eyes of the the Water), is a small fishing village with good beach and fantastic restaurants and friendly bars. Closeness to Albufeira and Vilamoura make it ideal location. The development is a modern building complex and has a tenniscourt and swimming pool. There is private parking and accessible by lift. Ours is a one bedroom apartment but we have sofa beds which can sleep 4 more so 6 people can stay. The best point is view from the balcony which is larger than most other apartments in the complex with beach views. It is also sheltered so if it is a bit breezy in the cooler months, you will still feel the benefit of the warm sunshine. The views of Olhos beach and Falesia beach are breathtaking,we also overlook the pool which does not get crowded, even in high season. More than half of our bookings this year have been from previous years clients which is pretty good considering we have only been open from last April!We offer discount to second time visitors. Bathroom with bath/shower with glass screens, wc. Recessed ceiling lights. Lounge with double sofa bed and 2 chairs. TV cabinet and TV 32in LCD. Sky box (Free view English channels), DVD and Hi-Fi. Wooden kitchen cupboards, with built in electric hob, multifunctional oven, microwave, dishwasher, washer and dryer, fridge freezer and telescopic extractor. Double basin sink and recessed ceiling lights. The apartment is approximately 2 km from Balaia Golf Course and 3km to Sheraton Pine Cliffs, both located in Albufeira. Plus numerous top class golf courses within short driving distance in Vilamoura, Vale de Lobo. Notes on accommodation: Fully air-conditioned. Suitable for families with children of any age . Outside: Landscaped gardens, exterior swimming pool, tennis/multi purpose playing court, pool side and garden terraces, roof terrace. Cleaning / Towels / Linen / Maid service: Towels and linen are included in the price. Changed weekly. The property is cleaned before arrival and on departure. Beach towels and midweek extra linen may be available at extra cost. Other: Entrance hallway. Fantastic aspect, plenty of winter sunshine, lovely large wraparound balcony. One of the very best apartments in the whole three blocks. Thank you for being such a good guest and we look forward for you in future years. Thank you for the wonderful review. We thank you very much for the wonderful review that you have submitted. Having stayed at Vista Dad Ondas before I knew that the location of the apartments in Olhos d'Agua is excellent, within a few minutes walk from all the restaurants and beautiful sandy beach. This apartments location in the block is very good, set on the first floor with a balcony that wraps around overlooking both the front and pool area of the block and with lovely sea views. The apartment is clean and well equipped and we found the owners to be very friendly and helpful. We stayed for 2 weeks in August with 2 adults and 3 children which was no issue as the apartment has 2 large sofa beds. I would highly recommend this apartment, we loved it and will definitely be back! Thank you very much for the review. We spent about 2 weeks there in early February 2017. The place is perfect for us as it is close to bus stop, taxi stand, supermarkets and beaches. The tennis court is a plus for us. The unit is clean and tidy. We had an enjoyable and pleasant stay. Thank you very much for the review. Good to know that you enjoyed your stay. Apartment was clean with a well equipped kitchen. Bed was very comfortable and bedroom had air/con/heating. The living area had an electric radiator which we needed occasionally in Dec/Jan. Location was perfect, close to a supermarket, taxi rank and bus stop.on the negative side the TV did not work and as we did not opt for maid service we only got one bath and one hand towel each for a two week stay. There was no extra bed linen to change the sheets either. Olhos De Agua would be a lovely resort to visit in the summertime but I personally would not go there again at Christmas /New Year. There were only two restaurants open and not many bars open either. The Top10 sports bar is well worth a visit where Mary will look after you well. Ohlos de Agua Beach is seen from the apartment balcony. Walking to the beach less than 5 minutes. The breathtaking beautiful sandy beaches in the Algarve are amongst the finest in Europe. 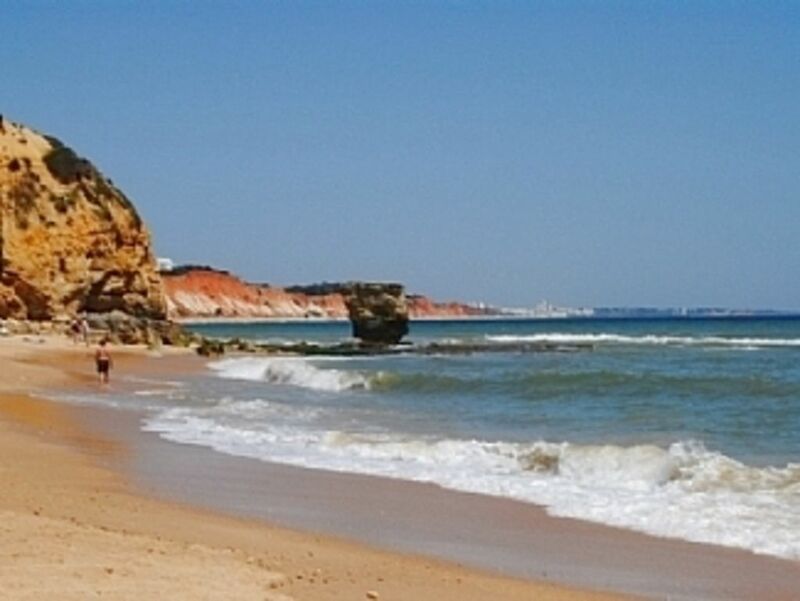 There is a long sandy beach of Praia de Falesia nearby, which stretches all the way to Vilamoura. Faro Airport is 25 minutes drive via the A22 motorway. Return transfers from airport can be arranged on request. Located on the beachfront with bars, restaurants, banks and shops all close by. Most of the Algarve is approachable by car very easily. Booking Notes: Welcome packs available on request. Apartment price includes all utilities and air-conditioning. Please contact for booking. Changeover Day: Change over day check out time - 12:00 pm. Change over day check in time - 3:00 pm.